Well the fifth and final book in the series about the Bang Saray Boys has been published and I for one am going to miss this eccentric ‘band of brothers’. The reviews speak for themselves and this series about ex-pats has become the ‘must have’ books collection about life in Thailand. You could be forgiven for thinking that the books are about a group of old ex-pats who like playing dominoes and putting the world to rights, but they are about so much more than that! They are about a group of friends and the trials and tribulations of life and growing old in an ever-changing world. It’s about their shifting perceptions of this world and also themselves as they cope with love and romance, friendships, old age and death as they set out on a series of misadventures. Their self-appointed leader is Gary Sloan, or ‘Sloany’ as everybody knows him: a bar owner and now a resort owner, who sees himself and the rest of the world in a different light to everyone else. The characters jump right out of the pages at you and once they grab you they won’t let go. The books are laugh out loud funny in parts but be warned, they will also make you cry as you share the characters’ stories. I managed to contact the author Guy Lilburne and I was surprised to learn that this series of five publications was originally intended to be only a one-off book. It all started with the release of “Living the Dream”, but the response to that book was so overwhelming that a follow-up “Loving Life” was inevitable. A worldwide army of fans ensured that more books were to follow and “Taff’s Treasure”, “Another Day in Paradise” and “Bang Saray Boys: The Movie” completed the set, with even more memorable characters joining the original Sloan Square bar boys. It’s sad that Guy Lilburne has decided not to write any more about these lovable rogues, but the good news is that he is currently working on a screenplay of the series for British TV, so hopefully a wider audience of fans can join the ranks of readers all over the world who have already fallen in love with the gang. 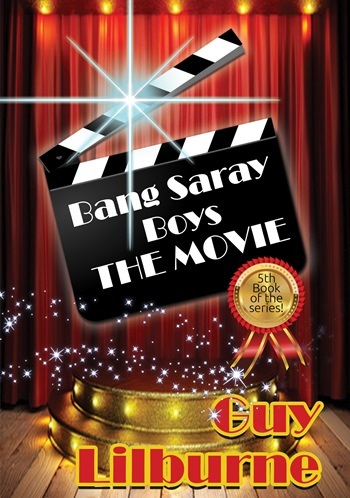 All Guy Lilburne’s books are available on Amazon and the Bang Saray boys have their own fan page on Facebook. Do yourself a favour and take a look at these books. You won’t be sorry.